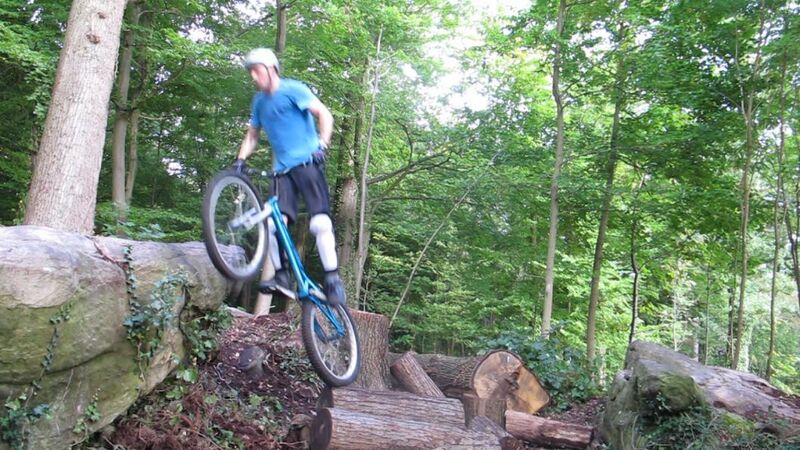 A variation of the rear side hop is to land your front wheel first. Locking the front wheel onto the obstacle and pushing on the handlebars will help you level the bike up and position the rear wheel very precisely. 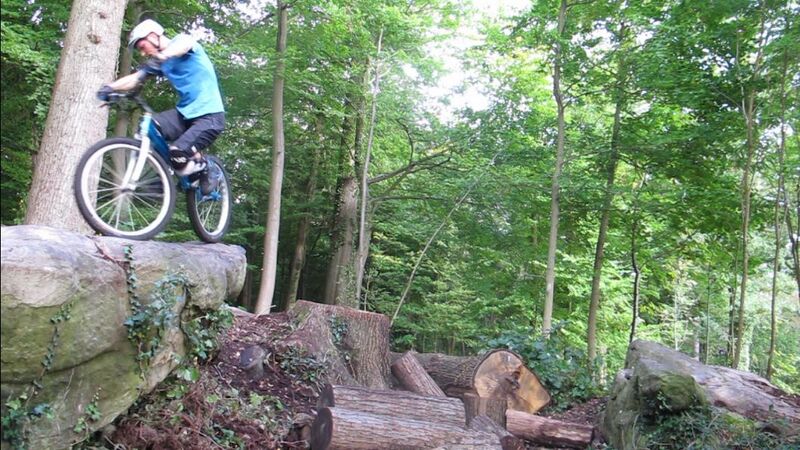 It is a smoother and less physically demanding alternative to big sidehops. Because the front wheel is positioned higher up when you start, the height you must reach up with the front tyre is lower than the height you would have to hop if you were side hopping directly to back wheel. This technique offers much more grip control upon landing, especially in gnarly natural sections where it will avoid the stupid dabs that are typical with the less elaborate "hit-or-miss" approach of big sidehops. 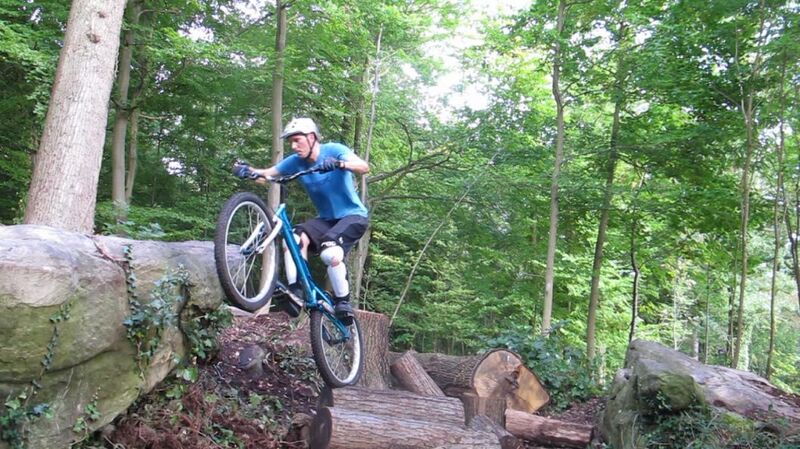 Position yourself with the obstacle on your front foot side, balancing over the rear wheel. 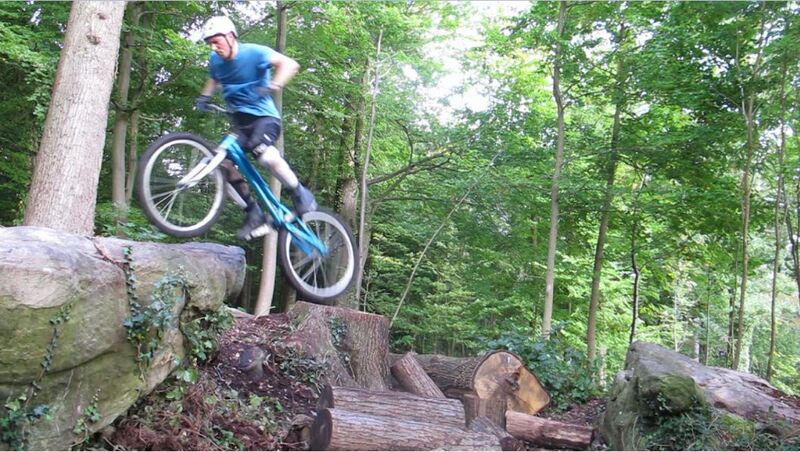 The compression phase is the same as in a regular side hop, crouching and lowering slightly the front wheel. 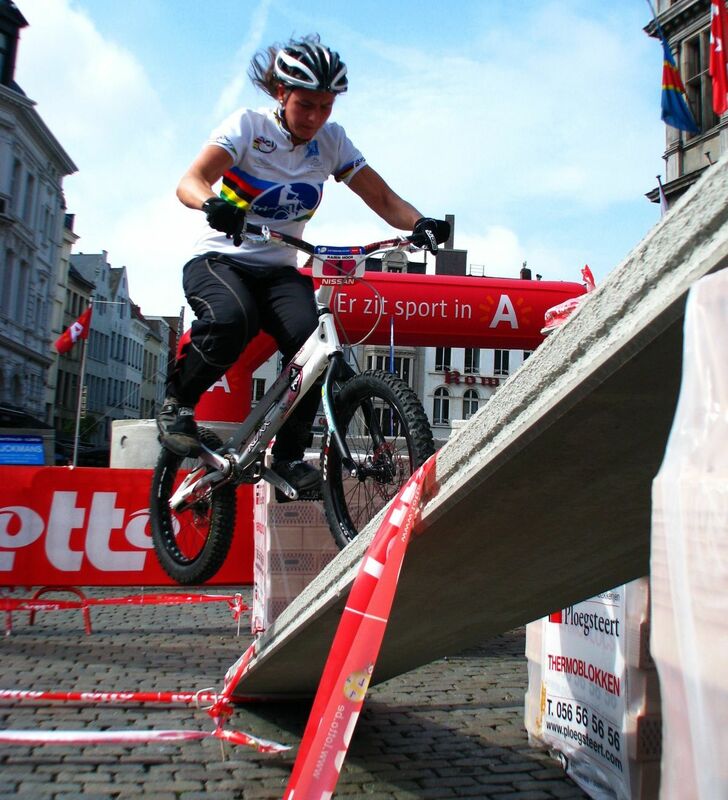 Skew your impulse sideways by leaning your shoulders slightly towards the obstacle, on your front foot side. Just when you have reached full compression, spring into extension with a firm jump impulse. 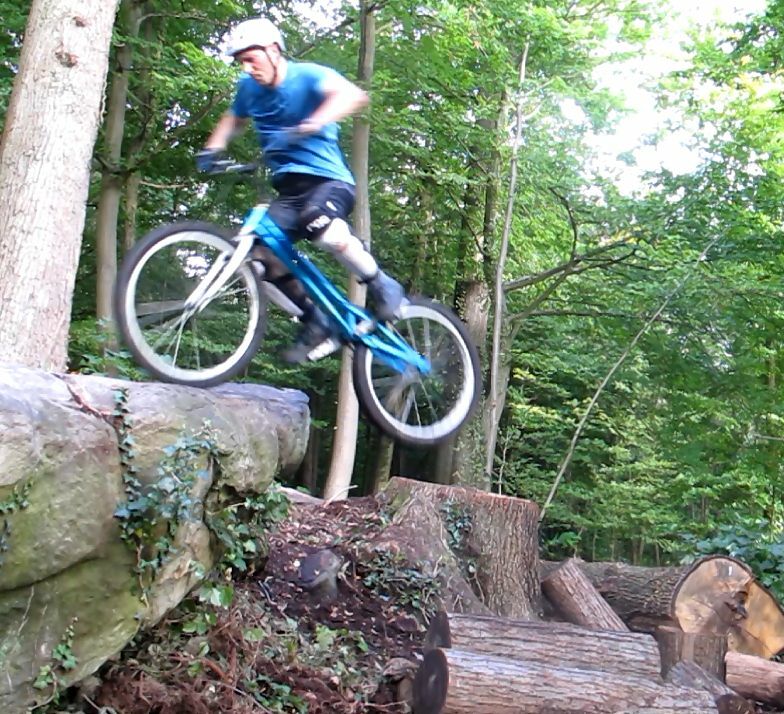 Tuck your knees up to take-off while actively aiming your front wheel at the obstacle. 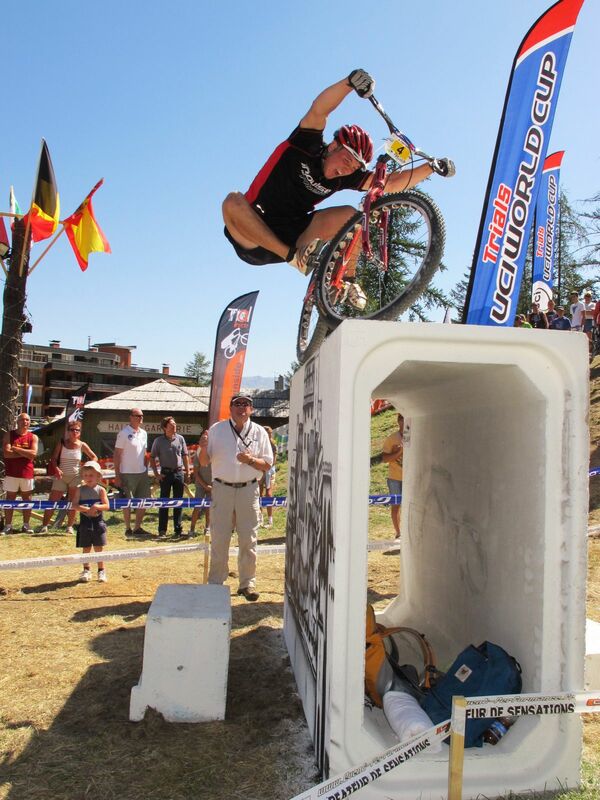 As soon as the front tyre has reached the upper edge of the obstacle, force the front wheel down. Lock the front brake and push further on the handlebars to tilt the bike forward, transferring your weight over the front wheel. Use this weight transfer to lift the rear wheel higher up and swing it sideways over the obstacle to secure your position. Maintain both wheels locked to secure your grip and make any necessary correction hops to firm up your position. 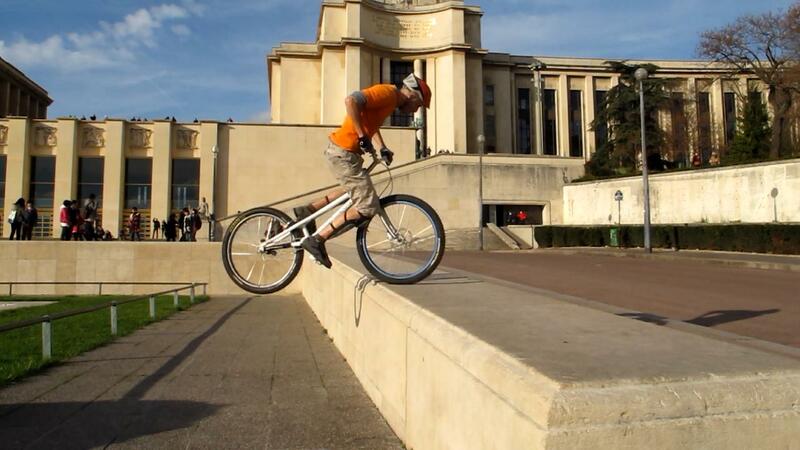 1° Position yourself with the obstacle on your front foot side, balancing over the rear wheel. 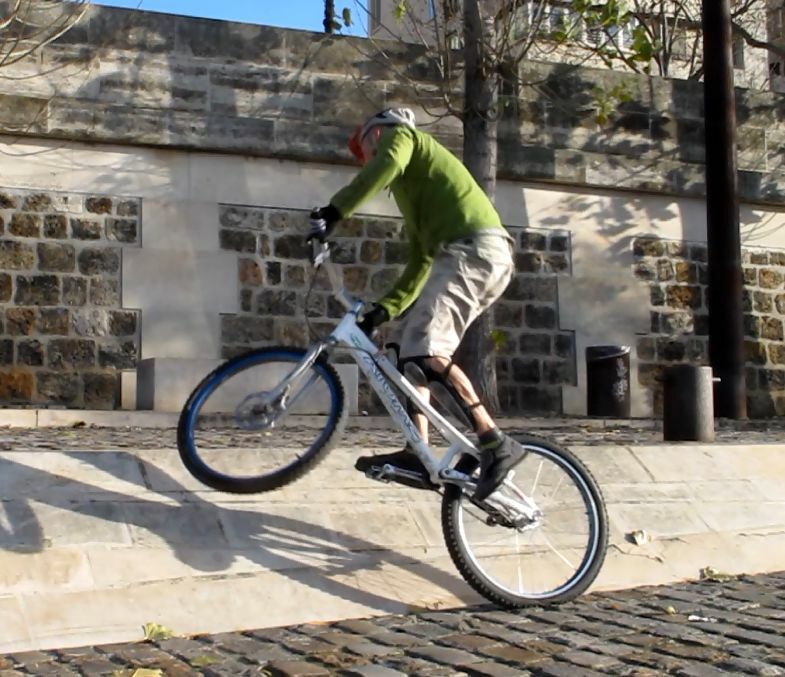 2° Same as in a regular side hop, crouch and lower slightly the front wheel, arms stretched. 3° As you jump, skew your impulse sideways by leaning your shoulders slightly towards the obstacle, on your front foot side. 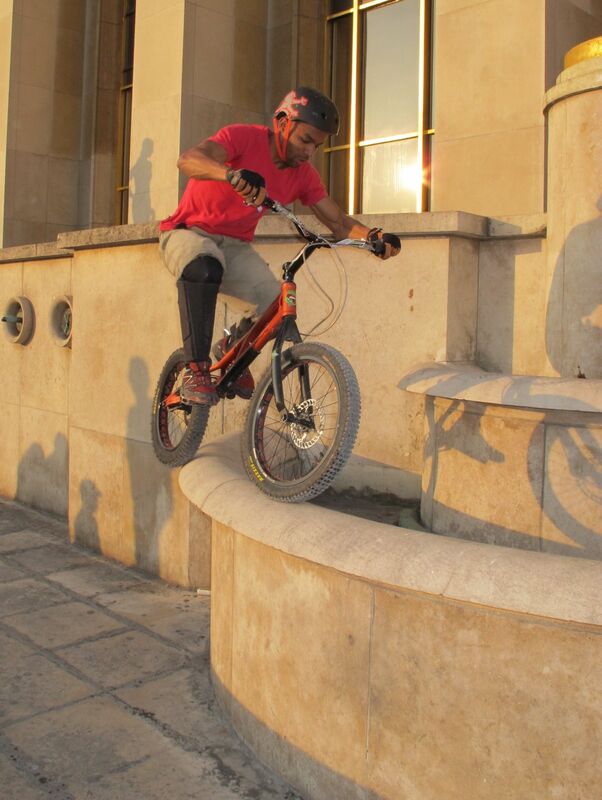 4° Tuck your knees up to take-off the whole bike while actively aiming your front wheel at the obstacle. 5° As soon as the front tyre has reached the upper edge of the obstacle, force the front wheel down to secure your position. 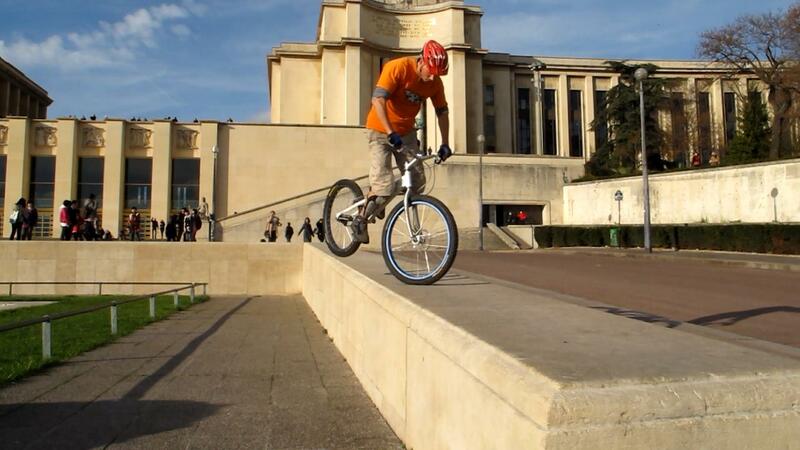 6° Lock the front brake and use the front wheel as a pivot on top of the obstacle, to swing the rear-wheel up over the obstacle. Jack Carthy in precision mode, front wheel first. When you side hop to your back foot side, you tend to aim the full bike at the obstacle (often even landing directly to back wheel). That is because you have a bigger lateral weight transfer to perform (moving your centre of gravity) from the front foot support across to the back foot side, and you don't want to miss the edge. In contrast, when you side hop to your front foot side, you lean about one foot closer to the obstacle and have a smaller lateral weight transfer to perform in order to achieve the right balance on top of the obstacle. This also makes it easier to use the front wheel as a pivot on top of the obstacle, to bring the rear wheel up and make the tiny adjustment necessary to get some grip with the rear tyre. 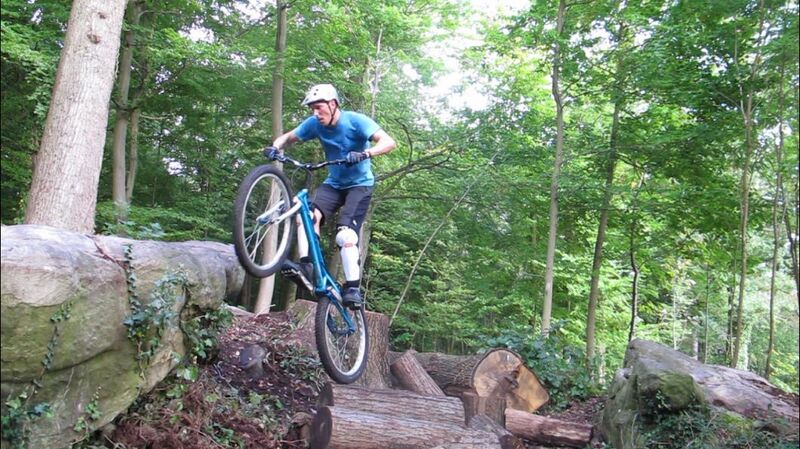 Swing your rear wheel up by pivoting over the front wheel. 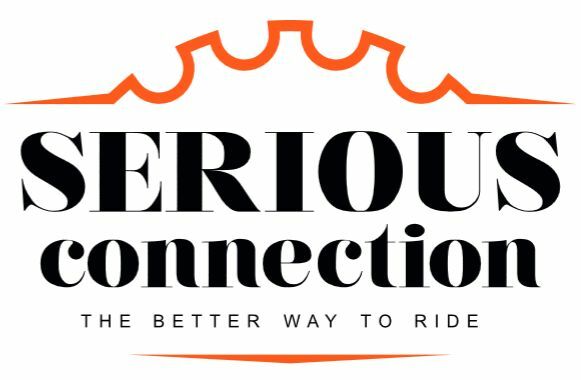 Most riders end up going higher on their front-foot side. This side hop variant is very energy efficient and you can land your front tyre with a lot of precision for optimum grip. 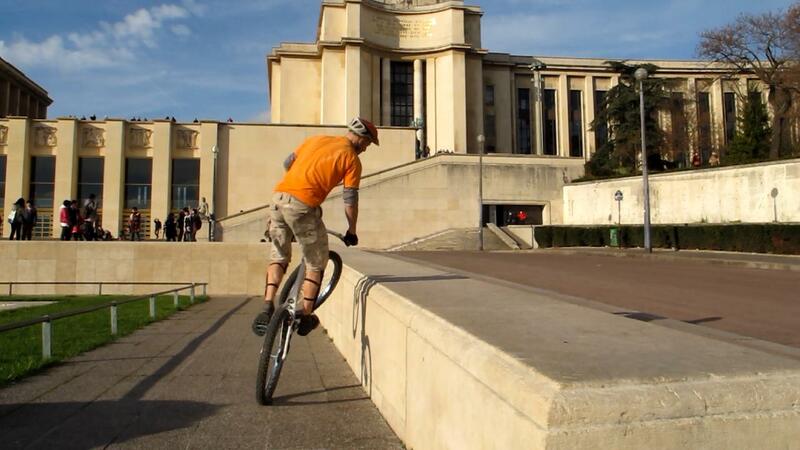 This approach also works well on railings or anything narrow, as long as you land your front wheel at an angle to avoid mishaps and increase the contact area (it will be harder to miss an edge with the full diameter of your front wheel than with a tyre's width). Landing the front wheel at an angle gives you more grip but you must actively re-align the whole bike to land the rear wheel correctly (which is tricky too). By controlling your body transfer over the front wheel, you will determine how much rolling you can get on the front, either to secure the rear wheel onto the obstacle, or to finish with a wheel-swap and land your rear tyre exactly where your front wheel was (bonus). Drive the rotation with your torso as you jump. 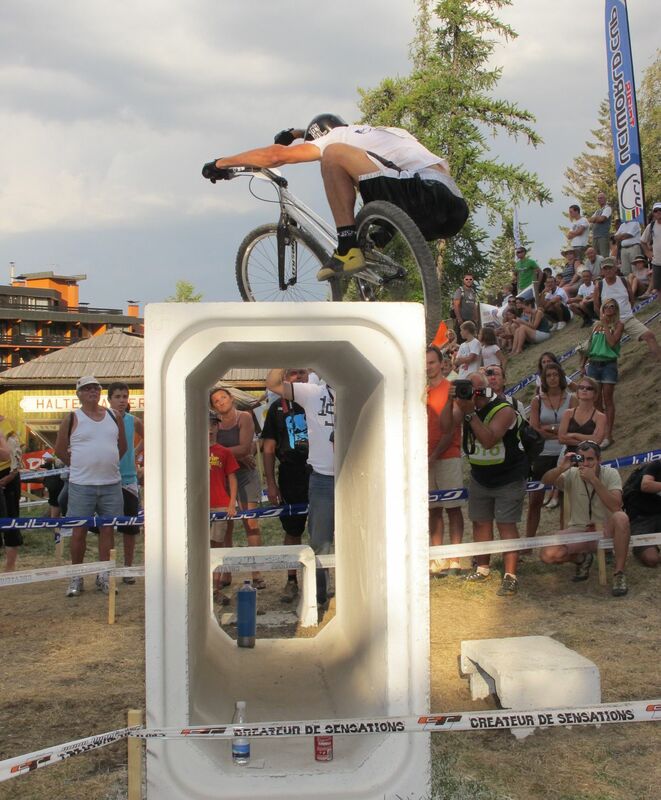 Just to make things a bit more interesting, maybe at demos, you can turn 180 degrees as you side-hop up an obstacle. This move combines a twisted extension driven by your torso with a nose-pick onto which you will pivot the bike over the front wheel. This will work best turning on your front foot side (i.e clockwise if you are right foot). During the pedal kick, swing your shoulders into an upward spiral, trying to look back. 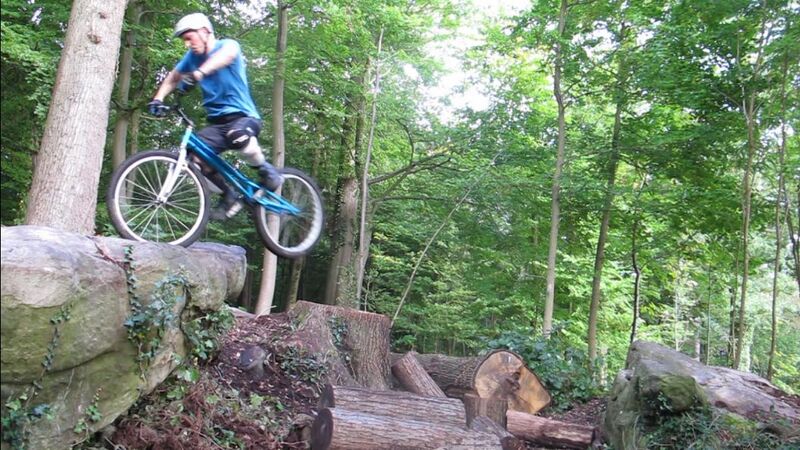 As you force the front wheel down onto the obstacle, transfer your weight over the bars to swing the rear wheel sideways and finish up the turn by pivoting on the front wheel. 1° As you jump, drive the rotation with your torso, on your front foot side. 2° Swing your shoulders into an upward spiral as you jump, trying to lurch over the obstacle. 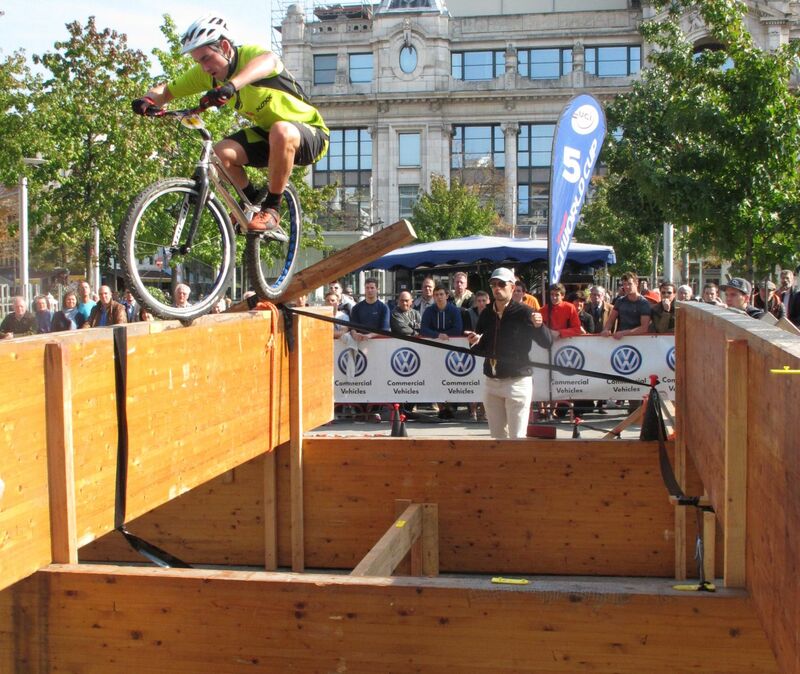 3° As you force the front wheel down onto the obstacle, transfer your weight over the bars. 4° Then swing the rear wheel sideways and finish up the turn by pivoting further on the front wheel.